Every time I visit a popular restaurant or a highly recommended tourist attraction overseas, there will always be a hall of fame where restaurants will display their award plates and attractions will show of their TripAdvisor 5 star rating and other awards. I think these awards build a level of confidence among customers as to what they can expect in terms of service and experience. At the same time, these awards acknowledge an organisation’s efforts to deliver an exceptional customer experience and encourage healthy competition. To me, an exceptional customer experience means going above and beyond a customer’s expectations. It can be as simple as listening to your customer’s wants and needs and helping them out. This could mean coming up with solutions to a customer’s problems or at least finding someone who can help with the problem as soon as possible. I remembered one time when I was attending a wedding dinner at a hotel, I experienced a wardrobe malfunction – the soles of my leather shoes came off! When I approached a hotel staff for help, he volunteered to lend me his spare work shoes for the night without even taking down my details. This is to me a truly exceptional customer experience! Thus, I am glad to hear that we also have a Singapore Experience Awards that celebrates outstanding experiences in the tourism sector, while promoting the innovation and creation of distinctive and compelling Singapore experiences. 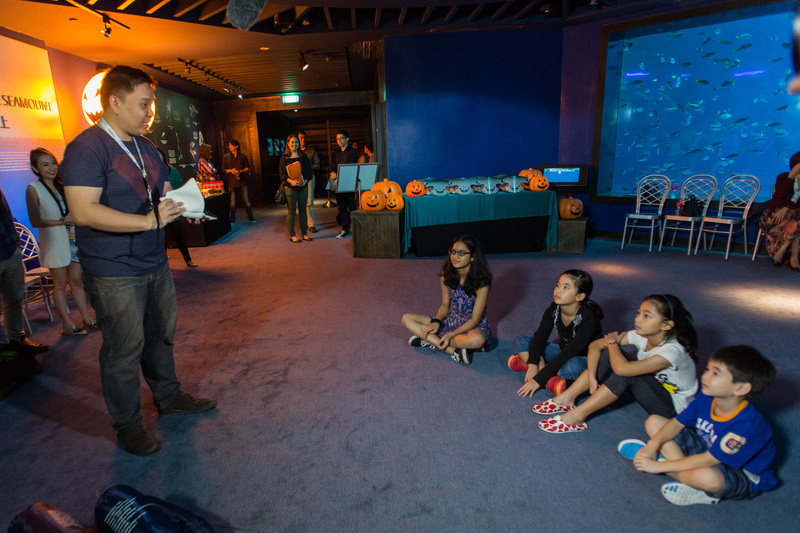 Oceans Dreams – a programme by Resorts World Sentosa S.E.A. 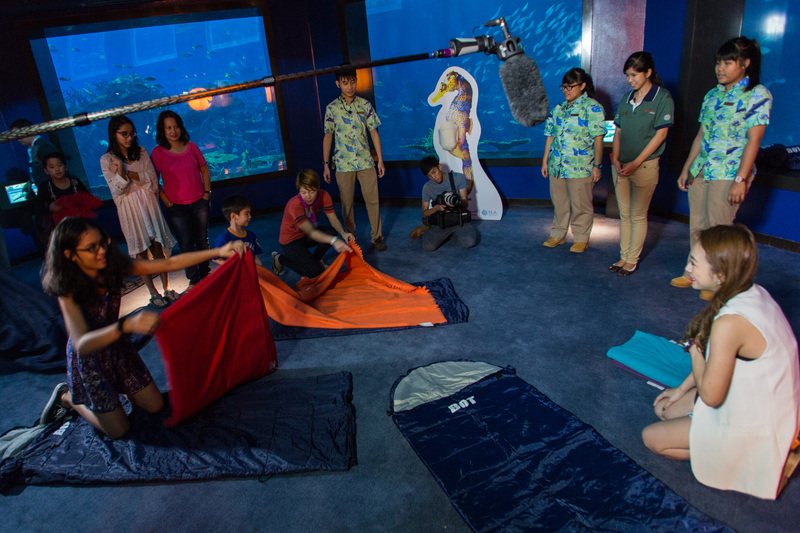 Aquarium – is a finalist this year for the Awards, and we went behind the scenes to understand what factors make the Ocean Dreams programme such a unique experience. What makes this programme unique is perhaps what happens after all of the above – a sleepover at the S.E.A. Aquarium’s large viewing gallery – the Open Ocean tank! Don’t expect hotel mattresses and fluffy pillows though – sleeping bags and blankets are provided. 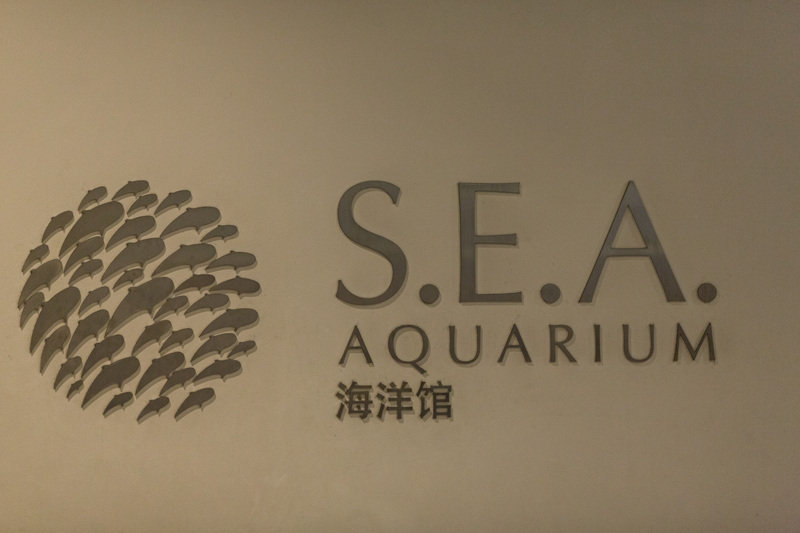 We didn’t do a sleepover at the Aquarium – instead we had a guided back-of-house experience where we met the staff at S.E.A. 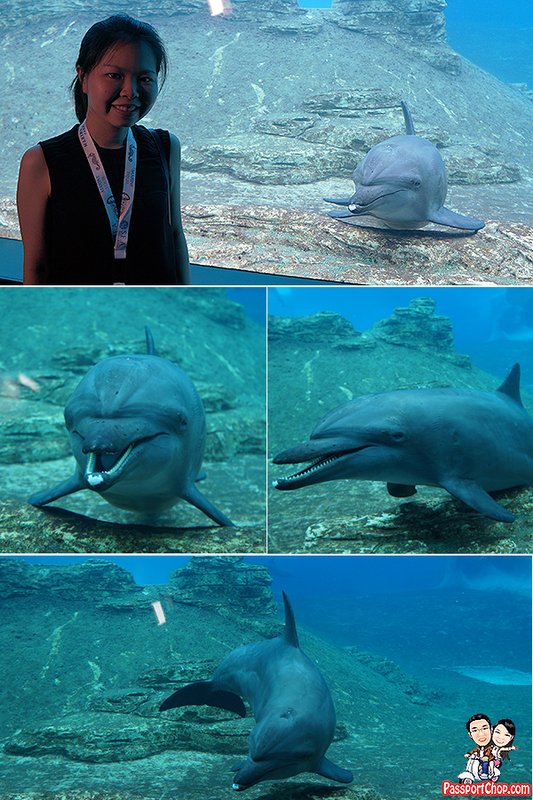 Aquarium and saw first-hand how they prepared for their daily operations as well as for the Ocean Dreams tour. We had the chance and privilege of having a one-on-one interaction with the Aquarist – a knowledge master on marine animals, and the Manta Captains –storytelling experts and tour facilitators, where everybody works together to create a captivating experience for every Ocean Dreamer. During our guided tour of the Aquarium, we were greeted by a friendly dolphin who happily posed for photos with many people in our group. Ocean Dreamers will get to enjoy this private interaction time with the dolphins in the morning after breakfast! This is a very rare sight as during the usual Aquarium opening hours, this area is usually very crowded and noisy as the crowds try to get a glimpse of the dolphins and at times, there are people doing their Dolphin Trek experience at the Dolphin Lagoon . The S.E.A. Aquarium is one of the world’s largest aquariums and is home to more than 100,000 marine animals from over 800 species. 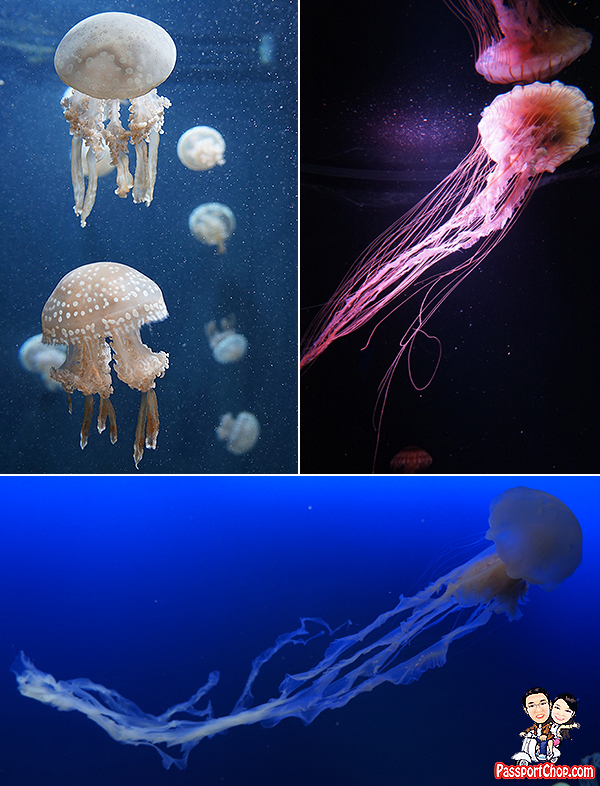 My favourite exhibit has to be the jellyfishes as they gracefully swim around their small aquarium tanks. 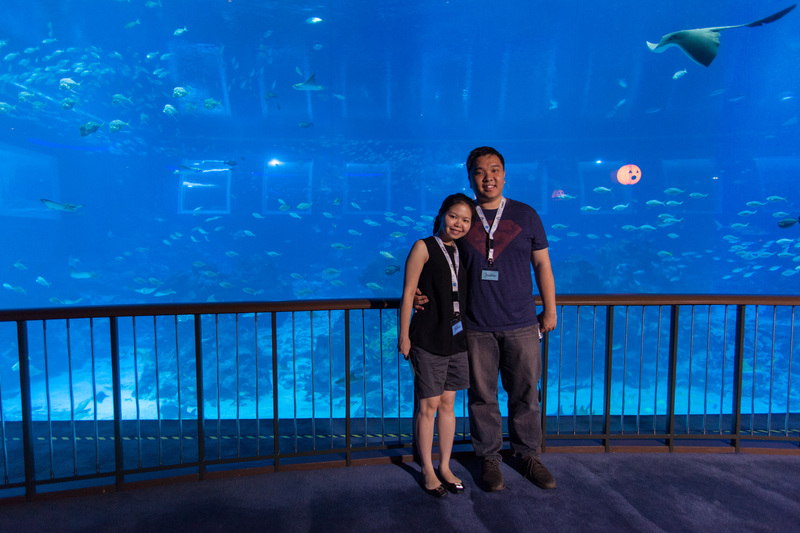 The highlight of the tour had to be the huge Open Ocean tank – picture time with the manta rays and the fishes behind us! By the way, did you notice the orange pumpkin head within the tank behind us? That is actually part of the Halloween themed décor that the Ocean Dreams team had put up in parts of the S.E.A Aquarium. It is the small details that makes each visit to the aquarium a different experience. 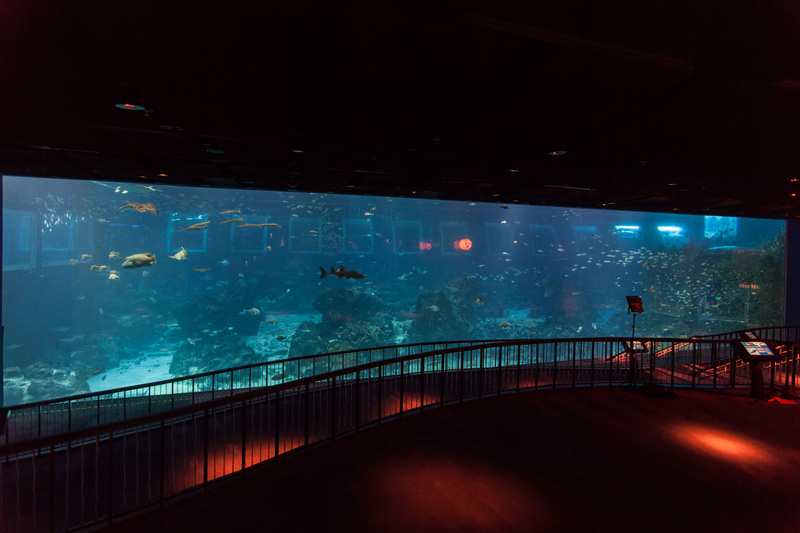 This shows how big the Open Ocean tank is – this is one of the world’s largest viewing panel at over 30 metres wide and 8.3 metres tall. Imagine the shiokness of sleeping in front of this huge tank and watching the fishes and manta rays swim gracefully within the tank – it will feel as if you are on the ocean floor! 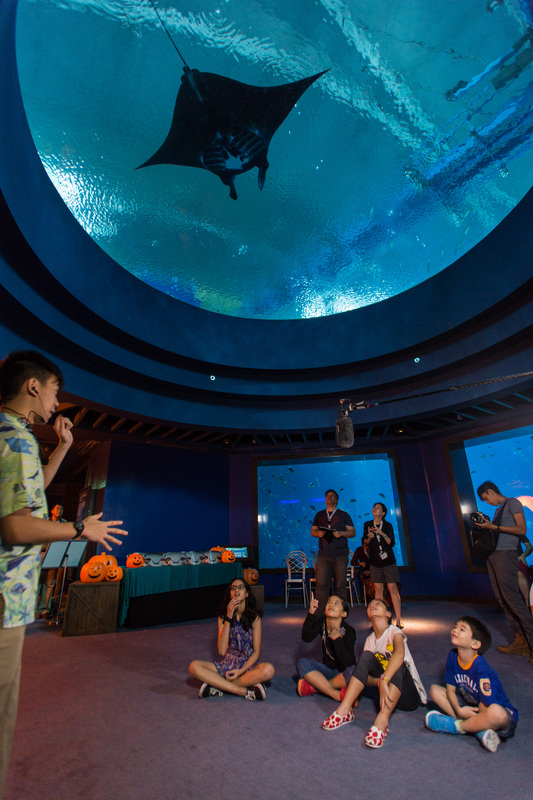 As part of the Ocean Dreams’ back of house experience, you will learn what the manta rays eat here at the S.E.A. aquarium – krill. 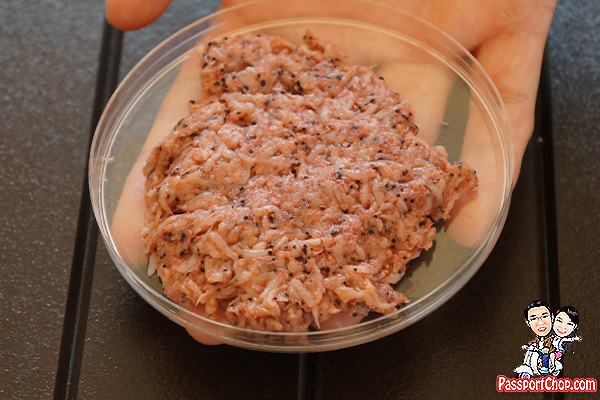 Krill are small crustaceans – prawn-like creatures that have higher protein content compared to plankton that the rays eat in the wild. We saw the manta ray feeding session – not something that a regular visitor to the S.E.A. Aquarium can see but as an Ocean Dreamer, you get to watch professional Aquarists feed them. Just a side note, there are 3 big manta rays in the Open Ocean tank and they are creatively named as M1, M2 and M3. To differentiate them, look at the patterns on the underside of the manta rays – if there is a white stripe, that’s M1; almost completely black, that’s M2; a V-shaped mark, that’s M3. In the picture below, you are looking at M3. 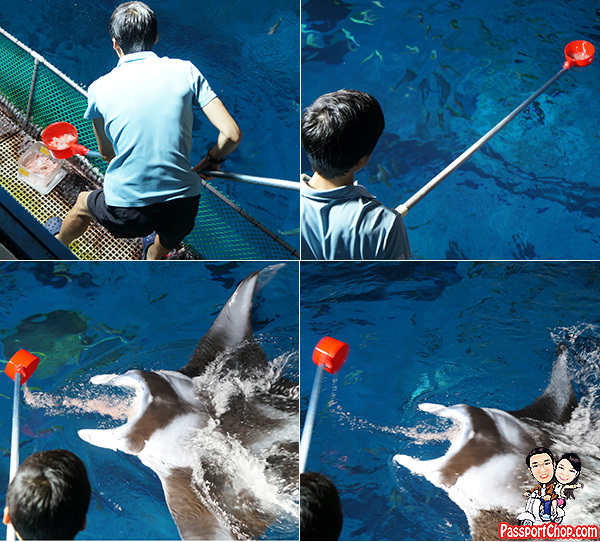 A step-by-step pictorial guide to the feeding process of the manta rays in S.E.A. Aquarium – the manta rays will swim in circles after each feed as the Aquarist replenishes the krill for the next feed. 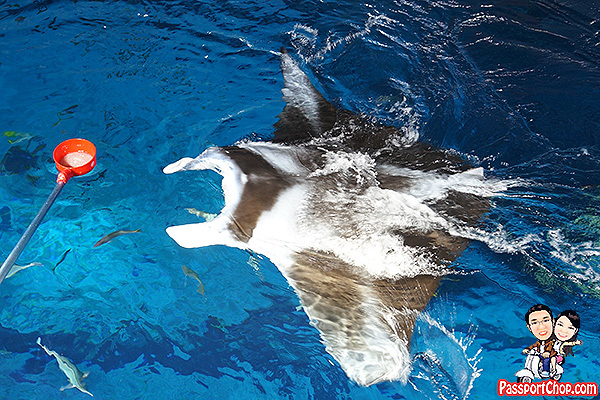 The manta rays just looked so graceful all the time even while feeding! We were brought to the kitchen where food for the manta rays and all marine animals in S.E.A. Aquarium is prepared – sorry Ocean Dreamers, you won’t be going to the kitchen to see the food preparation! 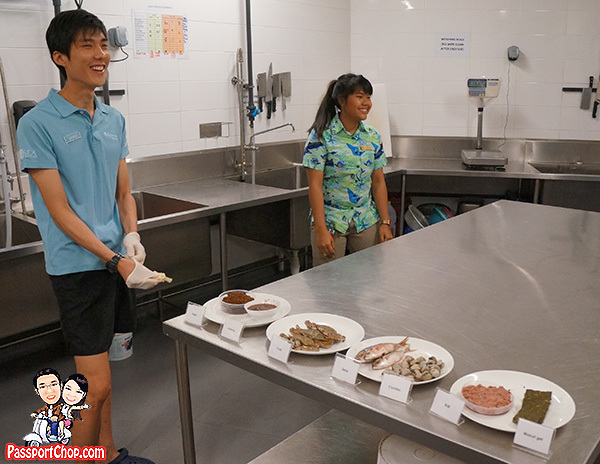 Here at this kitchen, our Aquarist educated us on the various food that the marine animals feed on daily and the preparation process behind it. We were surprised with our first challenge of the day. 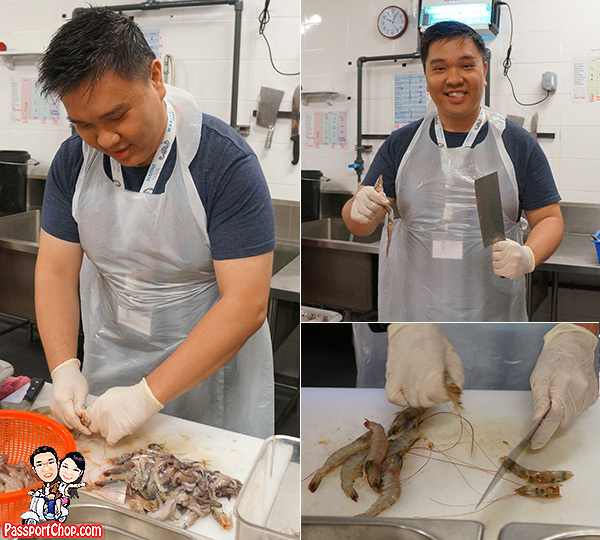 Me – equipped with an apron and gloves – taking on the challenge to prepare a 500-gram feed comprising prawns, small fish and squid in less than 3 minutes. I have to say this is hard work and the Aquarists are required to prepare a lot more food (about 4 kg for each manta ray!) than my measly 500-gram food preparation. This work seemed mundane e.g. cutting off prawn heads, chopping the fish in half but someone has got to do it to keep the S.E.A. Aquarium running! 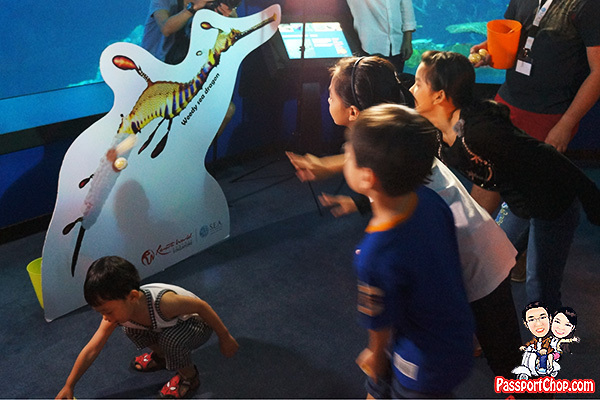 … and keeping the Ocean Dreamers engaged with educational games – here the kids are learning about dragonfish and how the male dragonfishes carry the eggs. For me, I took on the role of a Manta Captain, explaining what manta rays eat and how the 3 manta rays at the S.E.A. Aquarium are identified. I do a lot of presentations during my daily work but I have to say engaging a young audience (i.e. children) is very very different from doing presentations to adults. I felt the children’s disengagement, especially after they had been very actively folding sleeping bags and throwing balls as part of a game, and now they had to sit still listening to an uncle rambling on and on about manta rays – it felt so stressful! I think I should stick to my day job and this Manta Captain job is better left to the professionals like Jun Hao who is able to effectively engage the Ocean Dreamers – be it children or adults. When I talk to Manta Captains like Jun Hao, I can feel their passion for the job and their desire to share knowledge about anything in the S.E.A. Aquarium – this coupled with their ability to connect with S.E.A. Aquarium visitors, completes the whole Ocean Dreams experience and at a broader level, the entire experience at the Aquarium. I have been to too many attractions with excellent exhibits but still the experience was incomplete as they lacked the human touch because of indifferent staff or untrained guides. At S.E.A. Aquarium, you won’t feel this way – during our 90-minute guided tour through the Aquarium, we learnt so much about the marine animals in the Aquarium from our Manta Captain Diyana as she regaled us with stories of Mermaid’s Purse (shark egg cases) and how they grow from embryo to mini sharks. There are even live displays of these Mermaid’s Purse during the different months before they hatch. Everyone in this team has a role to play and without one or the other, guests would not be able to enjoy the complete experience of the Ocean Dreams programme. The Manta Captains keep the Dreamers engaged and excited about this sleepover and coordinate with their team-mates on logistics such as meals, sleeping bags and game items. The Aquarists keep the manta rays and the various marine creatures healthy and happy by ensuring their food is adequate and properly prepared. When I read about the Ocean Dreams programme, I thought to myself “wah so expensive – $193 just to sleep on the floor by the aquarium” but actually if you look at the efforts of the Manta Captains like Diyana and Jun Hao to deliver an entertaining and educational experience to the Dreamers, and how they make the whole sleepover as comfortable and enjoyable as possible to both the kids and adults, I say this is the type of exceptional customer service I referred to in the beginning of this blog post. I applaud this team of Manta Captains and Aquarists who work tirelessly behind the scenes to make every experience (including the Ocean Dreams programme) at the S.E.A. Aquarium such a fulfilling and educational one. This year, there are 29 awards in the categories of Customer Service, Experience, Marketing & Media, Outstanding Contribution and Special Recognition. Within the Experience category, the “Best Learning & Travel Experience” award recognises programmes curated to allow the curious explorer discover Singapore’s heritage and culture, world-class attractions, vibrant precincts amidst this modern cosmopolitan city. I wish S.E.A. 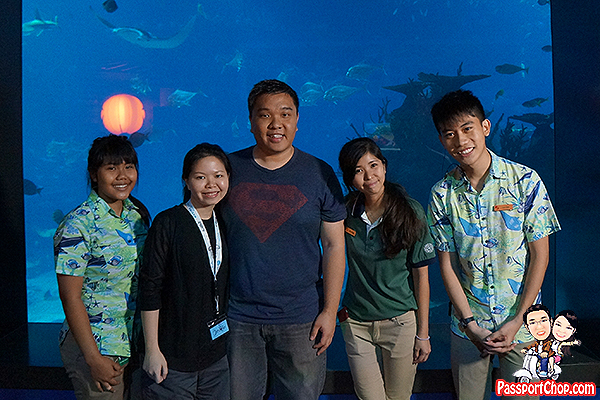 Aquarium luck in their quest to win the “Best Learning & Travel Experience” award as part of the 2014 Singapore Experience Awards! For more information on the other Awards finalists, check out the Singapore Experience Awards webpage. You can also share your favourite experiences and tag them with #yoursingapore, and your photo might get reposted by @Visit_Singapore Instagram account – instant fame! *Only applicable to S.E.A. Aquarium and Adventure Cove Waterpark Annual Pass holders as well as RWS Invites® members. RWS Invites members will enjoy 3% rebate on the purchase. Price includes: Admission to S.E.A. Aquarium within the stipulated hours of the programme, evening snack, morning snack, breakfast and GST. Sleeping bags will be provided to all participants. Participants can purchase discounted tickets to Adventure Cove Waterpark if they wish to continue their visit in the park after the Ocean Dreams programme. If you want to skip lines at S.E.A. 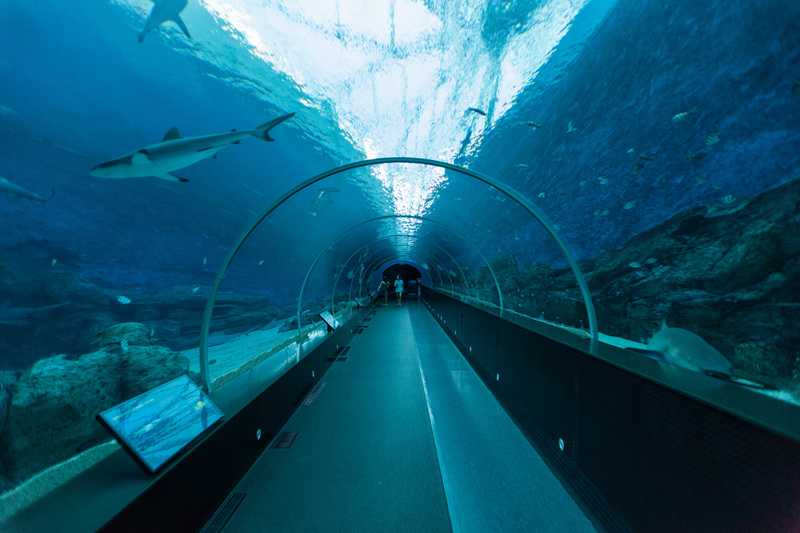 Aquarium and get discounted ticket prices up to 50% off, check out Klook! They offer exclusive insider deals from skip-the-line passes and ticket collection is hassle-free! You will receive your e-ticket(s) instantly after you book with Klook. All you have to do is to show the e-ticket(s) at the entrance and you will be admitted straight away! Look’s like an amazing place to chill out, and the images are cool..it seems like you guys had an wonderful time in this aquarium.. Absolutely love this article! Thank you for sharing these. Hope to hear more from you. Its a paradise to live in while living on earth. Hats off to photographer for his wonderful artwork.